The OMEGA Processing Game of the Week features the boys' 9th Region Tournament Semifinals and Finals this weekend through Monday. We will be broadcasting the games LIVE in audio from The Bank of Kentucky Center at NKU. 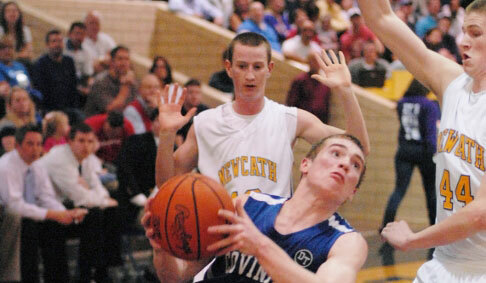 The Semifinal action begins on Sunday at Noon as NewCath and CovCath, the top two teams in the Region, will face off. These two teams played earlier in the season at Covcath but was called at halftime due too much condensation on the court. The Colonels were winning 31-26. The second Semifinal game on Sunday at 1:30 features the winners of Conner/Dixie and Highlands/Holmes. Those games will be played tonight (Friday, March 7) starting with Conner vs Dixie at 6:30 and Highlands vs Holmes at 8:00 at The Bank of Kentucky Center. The 9th Region Boys Championship game will be played Monday night at 7:00 PM.